Today’s blog will deliver points to consider for digital magazine creation, design and distribution using 3D Issue digital publishing software. We are all familiar with the traditional printed magazines that you find in your local supermarket, or newsagents; glossy, vibrant with lots of pages. These publications face huge competition and launching a new magazine can be a gamble. A good way to hedge your bets would be to by-pass the print costs and move straight on to a digital version, test its success and proceed from your findings. As technologies develop magazine creation has too, more and more publishers are moving from printed editions to digital magazines. Just like creating a printed magazine, your digital version’s content should always be presented to the reader in the best possible way. “Content” refers to features utilized as well the information contained. The magazine you create with 3D Issue can be viewed on varying screen sizes to maximize your audience. From PC, to smartphone we have all platforms covered. I have included 6 easy steps to help you with your magazine creation. 1. Download the 3D Issue Free Trial or purchase a license of the software. 2. Install the software and set up your domains and logos, you can see how this is done using the video tutorials. It’s quick and easy. 3. Import your PDFs into 3D Issue software. 4. Go to the Design tab and choose which interactive features you would like to include. Simply apply these features to each page of your magazine you desire. 5. Go to the Output tab and select how you wish to distribute your digital magazine e.g. via Browser, Facebook, standalones such as USBs, CD’s and through the 3D Issue App which allows your end readers to view your publications offline on devices such as iPads and smartphones. Design: It is important to decide how you will present your content, who will it target and how. When designing your magazine there is no simple checklist that can define good design, but there are some essentials that tend to show up consistently. Tools: With the best tools you can achieve the best results. 3D Issue software is excellent in helping you to design and add interactive components to your magazine. Adding features such as web links, videos, audios, image galleries and so much more. Experience: Refers to the way in which you feel, think, or learn, with 3D Issue software you can provide various learning methods including sound, music, voice-overs, visual animations and much more for a more positive, accessible reading experience. Emotional Appeal: Today we are increasingly focusing on the emotional aspects of design and by asking “How will it make people feel?” in addition to “How will it look?” The software can engage and interact with audiences through the integration of mini films, audio interviews and moving images, stimulating an emotional response in the reader. Sustainability: Designers must consider the impact their magazine creations will have on the environment and people. 3D Issue will help you to create a “green magazine” with no need for print, no paper wastage. Growth: Great design partnered with digital marketing has turned into a competitive advantage for companies that have learned how to do it effectively. There is plenty of research to suggest that digitizing magazines will bring in more revenue than staying with paper editions by simply designing interactive advertising with clickable links to the advertisers website or shopping cart. Distribution: In the format section you can select options which your publications can be activated on. 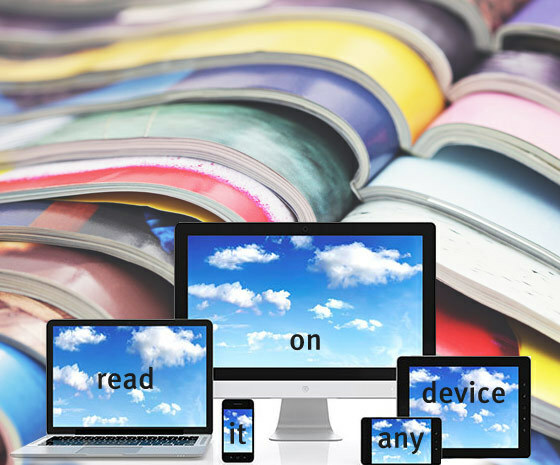 Checking these options will allow you to distribute your magazine to people across a variety of devices. Outputting via the browser means that you can present your magazine creations on your website, they can share the URL with their networks. Social networks like Facebook and Twitter allows your end readers to share with their friends, family, colleagues and other businesses, thus finding many more readers. To conclude, magazine creation, design and distribution is stress-free when you use 3D Issue software. Combine your creativity with our software and you can have digital editions in an instant that will reach more potential customers and can increase revenue substantially.